This is fascinating news: 90% of the distant Universe was thought to be missing, but it was recently found. And what’s weird is, it was found to be in the red. Quite literally. First, a bit of background. Galaxies are filled with hydrogen gas, and that gas is a major component of the clouds that collapse to form stars. When that happens, the hot stars ionize the gas: the flood of ultraviolet light strips the electron away from the proton, freeing both. If the electron gets near the proton again, they can recombine. Because of quantum mechanics, the electron can only exists in certain energy states, which are a bit like steps in a staircase. You can jump from the third step down to the second, but there is no second-and-a-halfth step. So it is with electrons. It used to be taught that this levels were like orbits, but that’s not a great analogy; the staircase is better. So if the electron is on the second level and drops to the first, it gives off energy in the form of light (just like when you step down you lose a bit of energy too, and it takes energy to go up a step). For the 2 to 1 step in hydrogen, the photon emitted is in the ultraviolet, and has a special name: Lyman alpha. Ionized hydrogen gas clouds tend to blast out lots of Lyman alpha. This makes it a good way to search for distant star forming regions; just look for that wonderful wavelength of light associated with the 2 – 1 transition of hydrogen. As it happens, we know that when the Universe was young, about a quarter the age it is now, star formation was going on at a much higher rate on average than it does now. So astronomers figured, hey, why not do searches for distant galaxies using Lyman alpha? They should pump it out, and make them easy to see. So they looked. And to their surprise, they only found about 10% of the galaxies they predicted they should! This has been a problem for some time. But it’s not anymore: a recent experiment by astronomers shows that the galaxies are there, but they’re hidden! 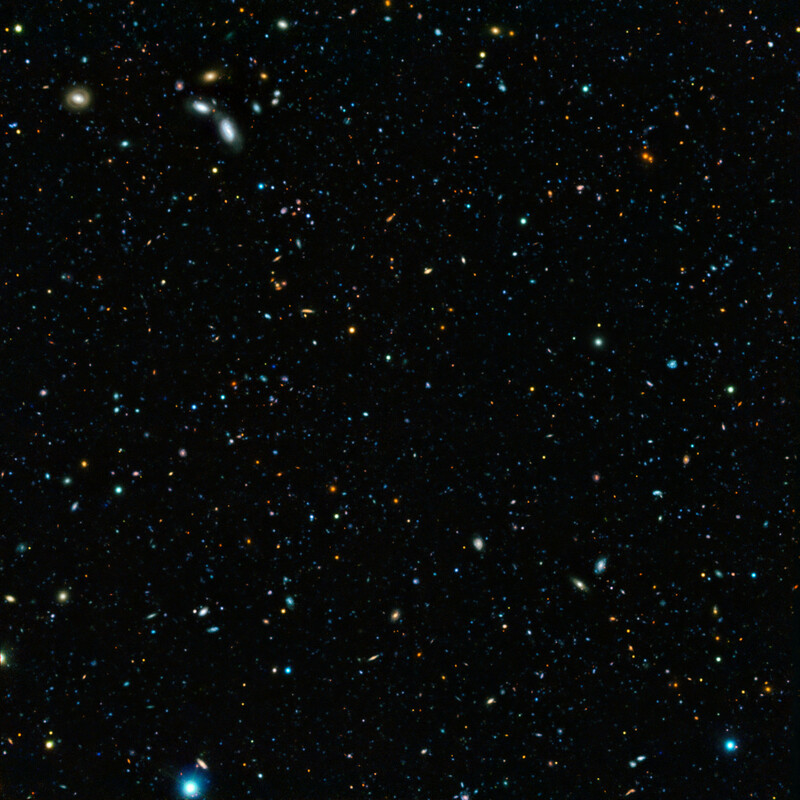 What they did is look in one part of the sky, using the GOODS South field (part of which is pictured above), trying to find Lyman alpha emitting galaxies. Then they looked at the same region, but looked instead for H alpha, the line emitted when an electron jumps down from the third energy level to the second. And guess what they found: tons of galaxies! The problem, they surmised, is that the galaxies are actually there and emitting Lyman alpha. But before that ultraviolet light can get out of one of those galaxies, it gets reabsorbed by gas inside the galaxy itself. We never see it. But H alpha can more easily escape the galaxies once it’s produced. For one thing, it’s red light, and that can penetrate the gas and dust better than the ultraviolet Lyman alpha light can. There are other more complicated reasons as well, but the point is, the galaxies were simply hidden from us before, but not anymore. By extrapolating their results, it looks like they found 90% of the distant Universe! I’ll note: this has nothing to do with dark matter. As it happens, 90% of the matter in the Universe is in a form that emits no light, but affects other matter through gravity. We know it exists, and you can find out why here. We know it exists locally, in nearby galaxies and clusters of galaxies, too. This new result doesn’t affect that, since the now un-hidden galaxies are very far away, like many billions of light years away. They can’t possibly affect nearby galaxies, so they don’t account for dark matter. I love this study. It’s a great application of simple logic, though it wasn’t so simple to do: they had to use a lot of time on a monster 8 meter telescope to do it! But they were able to answer a question that has been around for some time, and it really does look like they’ve solved it. And, as always, it makes me wonder what else is lurking out there in space, hidden but for a leap of logic and technology that will allow us to unveil it. Science is all about thinking around problems, and peeking into dusty corners. Sometimes the most interesting things are found there… including, in this case, the vast majority of the Universe!